Ostrya virginiana, Carya illinoinensis and Nandina domestica are just a few of the specimens found on golf courses at Campbell University’s Keith Hills Country Club that will forever live on thanks to digital herbariums. Campbell University’s College of Arts & Sciences, alongside similar programs at North Carolina State University and Appalachian State University, received funding from the National Science Foundation to preserve, document and archive thousands of plant specimens for scientific study around the world. Christopher Havran, Ph.D., and a team of student researchers set a goal of adding 4,701 specimens to the Southeast Regional Network of Expertise and Collections (SERNEC)’s herbarium in one week. Each specimen acts as a snapshot of a plant in time in space. Plucked from nature and dried in a controlled environment, a specimen enters a herbarium by being properly identified by its scientific name, collector, location found, habitat, description and date of collection. Digitizing this information allows anyone to access a high-resolution digital image of plant specimens at Campbell freely online, reducing costs and damage through shipping while increasing research infrastructure. Botany students at Campbell are introduced to this process during the first week of class and submit at least three accurately documented plant specimens as part of their coursework. Campbell senior Bobby Casey explained the process of drying a specimen using a temperature and light controlled environment. After collecting a sample, it is pressed between absorbent paper and cardboard for roughly a week. The dried plant is then frozen to eliminate any pests then mounted for labeling. The hardest part of documenting student plant specimens, he said, is ensuring those specimens come from the wild, not the garden department of a retail store. Back at the lightbox, Cece Shoemaker carefully unpacked specimens from manilla folders for photographing. Some sheets have fragment packets attached to them containing leaves or fruit that may have fallen off while drying. She scanned the label containing an identifying number and lines up the specimen on the camera’s lightbox and scanner. Although this is the first set of specimens in this round of digitizing, Shoemaker has helped with this process since last year. 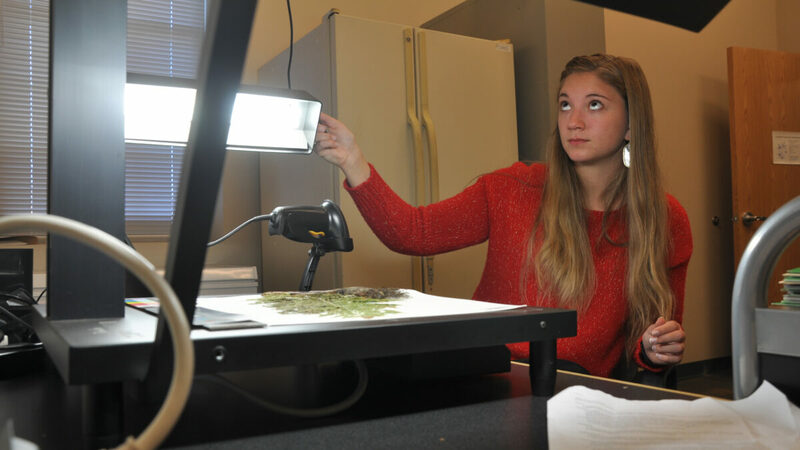 She said she hopes the research experience she is gaining in Campbell’s herbarium will help her when she begins working in the environmental science industry. Both Shoemaker and Casey work under the direction of Havran who found a passion for botany in the process of documenting and studying plants. He studied flora in Louisiana and Mississippi after graduating from Lebanon Valley College in Pennsylvania then moved to study the evolution of plants in Hawaii for his doctoral research. Since joining Campbell, he has worked alongside SERNEC to provide plant specimens and data for colleges and universities all along the southeastern United States. SERNEC is composed of 233 herbaria in 14 states throughout the southeastern portion of the United States. Together, they represent an almost total representation of regional plant information. Campbell’s herbarium, founded in 2011 by Havran and his team, has grown from a couple of plants to close to 5,000 specimens available for research within the renovated McLamb Environmental Science Center.